Chic and contemporary, this square coffee table gets its striking look from a beveled metal frame and clear, glass shelves. 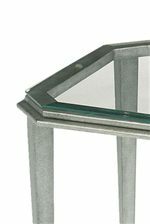 The spotless glass is framed with metal in an Antique Pewter finish, creating an exceptional staging area for decorative objects or coffee table books. 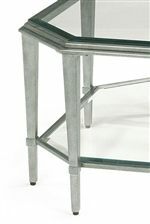 The Prism Contemporary Square Glass Cocktail Table by Flexsteel at Conlin's Furniture in the Montana, North Dakota, South Dakota, Minnesota, and Wyoming area. Product availability may vary. Contact us for the most current availability on this product. Whether your looking to dress up your casual living room sofa set or add a polished finish to your contemporary room decor, Prism occasional tables are a chic and fashionable choice. Sturdily constructed with tall, tapered metal legs and beveled metal frames, clear glass surfaces provide an ideal display space for decorative objects or framed photos. The geometric, metal frames display a subtle, Aged Pewter finish color that's sure to look sophisticated in any room. The Prism collection is a great option if you are looking for Contemporary furniture in the Montana, North Dakota, South Dakota, Minnesota, and Wyoming area. Browse other items in the Prism collection from Conlin's Furniture in the Montana, North Dakota, South Dakota, Minnesota, and Wyoming area.